Some recent selected publications from TCAS academic staff and affiliated researchers are listed below. 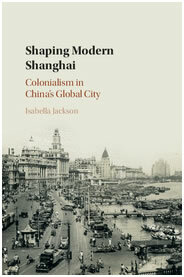 This new volume by TCAS historian Dr Isabella Jackson provides a new understanding of colonialism in China through a fresh examination of Shanghai's International Settlement. This was the site of key developments of the Republican period: economic growth, rising Chinese nationalism and Sino-Japanese conflict. Managed by the Shanghai Municipal Council (1854–1943), the International Settlement was beyond the control of the Chinese and foreign imperial governments. Jackson defines Shanghai's unique, hybrid form of colonial urban governance as transnational colonialism. The Council was both colonial in its structures and subject to colonial influence, especially from the British empire, yet autonomous in its activities and transnational in its personnel. This is the first in-depth study of how this unique body functioned on the local, national and international stages, revealing the Council's impact on the daily lives of the city's residents and its contribution to the conflicts of the period, with implications for the fields of modern Chinese and colonial history. Music is a widely enjoyed human experience. It is, therefore, natural that we have wanted to describe, document, analyse and, somehow, grasp it in language. This book surveys a representative selection of musical concepts in Chinese language, i.e. words that describe, or refer to, aspects of Chinese music. Important as these musical concepts are in the language, they have been in wide circulation since ancient times without being subjected to any serious semantic analysis. In this recently published volume by Prof. Adrian Tien (John Benjamins, 2015, 303 pp. ), a Natural Semantic Metalanguage (NSM) approach is used to formulate semantically and cognitively rigorous explications. Readers will be able to better understand not only these musical concepts but also significant aspects of the Chinese culture which many of these musical concepts represent. 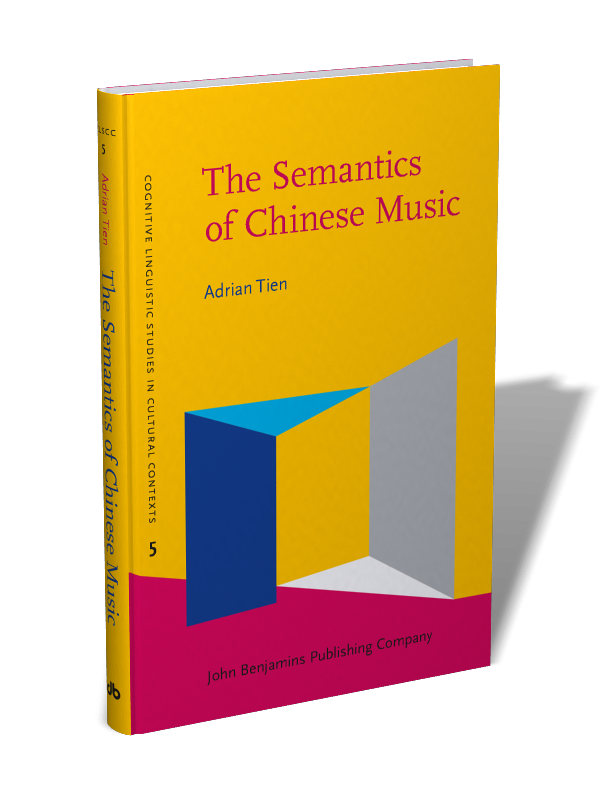 This volume contributes to the fields of cognitive linguistics, semantics, music, musicology and Chinese studies, offering readers a fresh account of Chinese ways of thinking, not least Chinese ways of viewing or appreciating music. This volume represents trailblazing research on the relationship between language, culture and cognition. Bickers, Robert and Isabella Jackson. Treaty Ports in Modern China: Law, Land and Power. London: Routledge, 2016, 320pp. Jackson, Isabella. Who ran the treaty ports? A study of the Shanghai Municipal Council in(eds) Robert Bickers and Isabella Jackson, Treaty Ports in Modern China: Law, Land and Power. London: Routledge, 2016. Jackson, Isabella. Expansion and defence in the International Settlement at Shanghai in (eds) Robert Bickers and Jonathan J. Howlett, Britain and China, 1840-1970. London: Routledge, 2015, pp187 – 204. Jackson, Isabella. Chinese Colonial History in Comparative Perspective, Journal of Colonialism and Colonial History, 15, (3), 2014. Jackson, Isabella. The Raj on Nanjing Road: Sikh Policemen in Treaty-Port Shanghai, Modern Asian Studies, 46, (6), 2012, p1672-1704. Jackson, Isabella. Review of China’s Foreign Places: The Foreign Presence in China in the Treaty Port Era, 1840-1943 by Robert Nield, in China Quarterly 225 (2016), 279-81. Tien, Adrian. 2015. The Semantics of Chinese Music. Analysing selected Chinese musical concepts. Amsterdam: John Benjamins. Tien, Adrian. 2010. Lexical Semantics of Children’s Mandarin Chinese during the First Four Years. LINCOM Studies in Language Acquisition 29. LINCOM Academic Publishers. Munich: Germany. Tien, Adrian. In press. Perspectives on “Chinese” Pluricentricity in China, Greater China and Beyond. In Rudolf Muhr, Kelen Ernesta Fonyuy, Zeinab Ibrahim and Corey Miller (Eds.) Pluricentric Languages across continents - Features and usage. Wien et. al. : Peter Lang Verlag. Tien, Adrian. 2015. Offensive language and sociocultural homogeneity in Singapore: An ethnolinguistic perspective, International Journal of Language and Culture 2(2): 142-168. Tien, Adrian. 2013. Bootstrapping and the acquisition of Mandarin Chinese: A Natural Semantic Metalanguage (NSM) perspective In Dagmar Bittner and Nadja Ruhlig (Eds.) Lexical bootstrapping: The role of lexis and semantics in child language development. Germany: De Gruyter: 39-72. Tien, Adrian. 2012. Chinese Hokkien and its lexicon in Singapore: evidence for an indigenised Singapore culture. In Rudolf Muhr (Ed.) Non-dominating Varieties of pluricentric Languages. Getting the Picture. In memory of Prof. Michael Clyne. Wien et. al. : Peter Lang Verlag: 461-480. Tien, Adrian. 2012. Chinese intercultural communication in the global setting, as reflected through contemporary key words in the Chinese multimedia. In Birgit Breninger and Thomas Kaltenbacher (Eds.) Creating Cultural Synergies: Multidisciplinary Perspectives on Interculturality and Interreligiosity. Newcastle upon Tyne: Cambridge Scholars Publishing: 169-184. Tien, Adrian. 2010. The Semantics of Human Interaction in Chinese E-communication. In Rotimi Taiwo (Ed.) Handbook of Research on Discourse Behavior and Digital Communication: Language Structures and Social Interaction. Information Science Reference. Hershey: New York. Tien, Adrian. 2009. Semantic Prime HAPPEN in Mandarin Chinese: In search of a viable exponent. Pragmatics and Cognition 17(2): 356-382. Carson, L. (2017). English fever: Problematising English language proficiency testing in South Korea. In O’Hagan, M. & Q. Zhang (Eds. ), Conflict and Communication: A Changing Asia in A Globalising World. Bremen, EHV Academic Press. Carson, L. (2014). An exploration of the roles of English in societal and individual multilingualism in Korea. In Bertoni, R. (Ed. ), EurKorea 2013: European Perspectives of Korea. Dublin and Turin, Trinity College and Trauben, pp2 – 25. Carson, L. & Rose, H. (2014). Language Learning in Higher Education (Special Issue: Focus on East Asia: Language learning and teaching), 4(2), 257-270. Carson, L. (2013). Perspectives on Korea within and from contemporary Europe: The cases of Italy and Ireland. In Bertoni, R. (Ed. ), Scorci di Korea/Glimpses of Korea. Dublin and Turin, Trinity College and Trauben, pp2 – 13. Carson, L. & Do, E.-J. (2013). Establishing a Korean language programme in a European Higher Education context: Rationale, curriculum and assessment procedures. Language Learning in Higher Education, 3(1), 151 - 171. Thinking through China (co-authored with John Blair). Rowman and Littlefield USA), August 2015. Editor, China and the Irish. Dublin: New Island, 2009; authored essays on “Ireland through a Chinese Mirror,” pp. 1-13 and “Oscar Wilde’s Chinese Sage [Zhuangzi],” 51-61. Mandarin edition edited by Wang Zhanpeng, Beijing: People’s Press, 2010. Western Civilization with Chinese Comparisons (co-author with John G Blair). First edition, 2006, published in Shanghai by Fudan University Press. Second edition, 2007. Third edition, 2010. Fourth edition in print and ebook 2015 re-titled to match re-edited version published in the United States as Comparing Civilizations: China and the West (New York: Global Scholarly Publications, 2013). “Irish Studies in China: the Widening Gyre” Studi irlandesi. A Journal of Irish Studies 3: 157-180. http://www.fupress.net/index.php/bsfm-sijis/issue/current. “The Poem on the Mountain: A Chinese Reading of Yeats’s ‘Lapis Lazuli’”, Yeats Annual 19: Yeats's Mask (December, 2013), 53-80. “Oscar Wilde’s Chinese Sage” China and the Irish (Dublin: New Island, 2009), 51-61. “Comparing China and the West: Who Is Ready for the Challenge?” (with John G. Blair), ASIANetwork Exchange, 16 (Fall, 2008), 48-56. “Framing Academic Discourse: East and West” in English Education and Liberal Education, ed. Sun Youzhong et al. (Beijing: Foreign Language Teaching and Research Press, 2008), 307-320. “China and the West: A Fresh Strategy against Provincialism” (with John G. Blair), Education About Asia 12:3 (Winter, 2007), 63-68. Thinking through China (with Jerusha McCormack), Rowman & Littlefield (USA) August 2015. Western Civilization with Chinese Comparisons (with Jerusha McCormack). A sourcebook of comparative readings. Shanghai: Fudan University Press, first edition 2006; second edition 2008; third edition, 2010. “Comparing China and the West: Remedies for Cultural Amnesia” (with Jerusha McCormack), Comparative Studies of China and the West, 1 (Winter 2013), 33-39. “Three Perspectives on 9/11: Entertainment, Politics, Mentality” in China Views Nine-Eleven: Essays in Transnational American Studies, eds. Priscilla Roberts, Mei Renyi & Yan Xunhua. Newcastle upon Tyne: Cambridge Scholars Publishing, 2011, 402-421. “Three Perspectives on 9/11: Entertainment, Politics, Mentality” Changes and Continuities: the United States after 9.11, ed. Mei Renyi & Fu Meirong, Beijing: World Affairs Press, 2009, 415-425 (in Chinese). “Comparing China and the West: Who Is Ready for the Challenge” (with Jerusha McCormack), ASIANetwork Exchange, 16 (Fall, 2008), 48-56. “Liberal Education at BFSU: A Pioneering Project” (with Jerusha McCormack), in English Education and Liberal Education, ed. Sun Youzhong et al, Beijing: Foreign Language Teaching and Research Press, 2008, 262-277. "'Feeling the Pulse' in the Chinese and Western Medical Traditions: The Importance of Qiemai as a Diagnostic Technique" (with Jerusha McCormack) in Thieme Almanac 2008: Acupuncture and Chinese Medicine, ed. Michael McCarthy et al. (Stuttgart: Georg ThiemeVerlag, 2008), 331-338. “Al Gore’s An Inconvenient Truth: Its Special Challenge to Chinese Environmentalists” Friends of Nature Newsletter (Beijing), 12 (Winter 2007), 26-28. “China and the West: A Fresh Strategy against Provincialism” (with Jerusha McCormack), Education about Asia 12:3 (Winter, 2007), 63-68. 2015 - “Xinjiang's Anti-Extremist Policies: Ramifications for Uyghur Cultural Identity and its compatibility with International Human Rights Law”. British Association of Chinese Studies, China Postgraduate Network. Bristol University, UK. July 2, 3. 2014 - “Bridging Worlds: A Comparative Study on the Effects of Ethno-Religious Policies on China’s Muslims”. Workshop on Developing a Sense of Belonging: Muslims in Europe and Hui-Muslims in China. Gulen Chair for Intercultural Studies, KU Leuven, Belgium. May 14, 15. 2014 - “Uyghur religious and minority rights in north-western China”. PhD Presentation Workshop, School of Languages, Literatures and Cultural Studies, Trinity College Dublin. January 20, 27. 2013 - “Human Rights and Religions in China”, Postgraduate Seminar, School of Languages, Literatures and Cultural Studies, Trinity College Dublin. April 5.